If you’re getting married in the Vaal Triangle, why not opt for a Vaal River wedding venue! The Vaal River provides opportunities for a unique and out-of-this-world wedding. Say your vows while taking in the beautiful and majestic river views. You and your guests will be stunned by the beautifully natural environments surrounding the Vaal River. 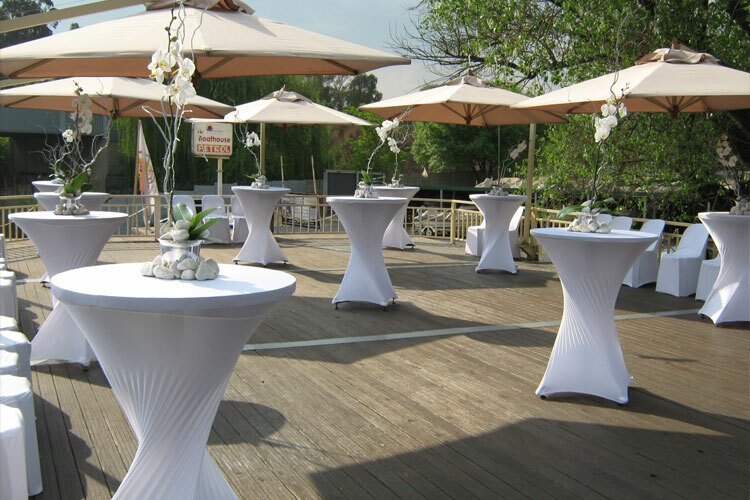 The Liquid Lounge is an excellent choice of Vaal River wedding venues. 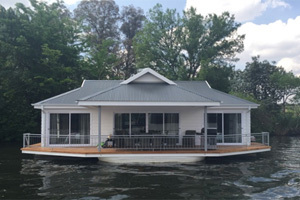 Not only will you have a River venue, but one that actually cruises down the river! We will offer you and your guests a unique and memorable wedding experience, exquisite cuisine and spectacular scenery – all aboard our luxury river cruiser. Professionalism and experience: When meeting with a wedding coordinator at a Vaal River wedding venue, pay close attention to their professionalism and experience in wedding planning. Ask all the questions you are concerned about, especially regarding your requirements. A professional and experienced wedding coordinator should be able to accommodate your requirements and provide suitable solutions. Facilities: Inspect your prospective Vaal River wedding venue’s facilities during your site visit. Visualise what your wedding will look like in the specific location, where you will take photos, where your guests will sit etc. Catering options: Determine whether the catering options will suit your requirements, and if they cater to your special requests. A tasting at your Vaal River Wedding Venue is also advised if possible. 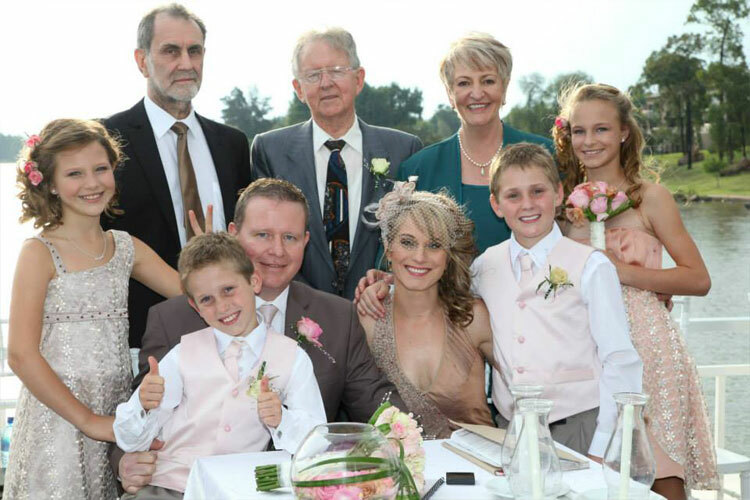 Testimonials: Do your homework regarding the Vaal River wedding venue. Comments on websites, social media sites and blogs should give you an overall indication of how previous clients experienced their wedding at the venue. The main thing about choosing the right Vaal River wedding venue, is finding one that will suit your theme and bring your wedding dreams to life. If you dream of a river wedding destination, then the Liquid Lounge truly does offer a unique and spectacular wedding opportunity. 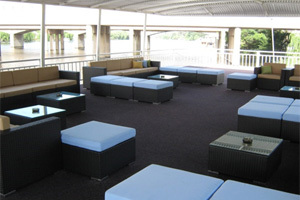 Unique venue: The Liquid Lounge is a truly unique function venue. 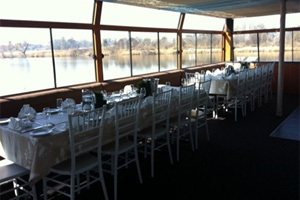 The luxurious river cruiser is not only a cruise vessel, but doubles as a spectacular Vaal River wedding venue. Your guests will be treated to an amazing cruise during your wedding reception, serving for a memorable wedding day. Our venue also contains all the facilities you would expect, including a cash bar, dance floor (if required), upper and lower decks, sufficient bathrooms for the ladies and gents as well as a high quality sound system. Excellent catering: Our experienced chefs will supply you with superb food and dishes that will exceed your expectations. Our buffet selection is excellent, offering guests a variety of deliciously prepared dishes. Talk to us about your specific catering needs, and what you have in mind for your wedding day. Professional wedding coordination: Our wedding coordinators have assisted many brides and grooms to turn their dream wedding into a reality. We will attend to every detail of the wedding, ensuring the décor, food, seating plan, DJ etc. is in order. 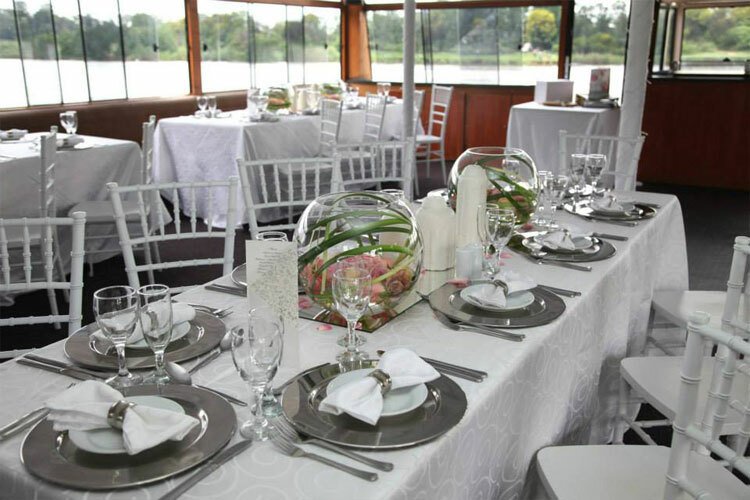 Leave the planning and coordination up to our team aboard your Vaal River wedding venue. 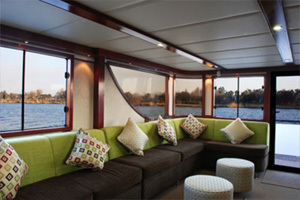 Make an appointment to see our luxury Vaal River cruiser, in order to book the date you desire. Contact us today for more information about our wedding packages, catering options and more. A Vaal River wedding venue such as the Liquid Lounge truly is a unique experience – one that will make your wedding a memorable event!